The SCOUT is the only paramotor in the world with no torque effect. This is achieved through the revolutionary Dynamic Torque Compensation vanes. The precisely engineered vanes and ring sections also significantly reduce drag, as much as 4 times less than a conventional tube frame. All of this means that the SCOUT performs like a high performance aircraft should… precisely going where you want it to go, with high efficiency and speed. This carbon fiber unit allows a very high strength to weight ratio. 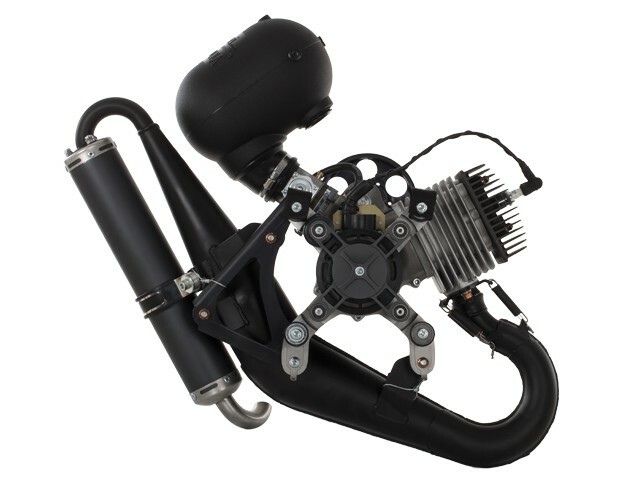 This machine weighs in at only 53 lbs, yet produces a thrilling 165 lbs of thrust with the Vittorazi Moster 185 powerplant. DTEC is a unique unique technology patented by SCOUT. 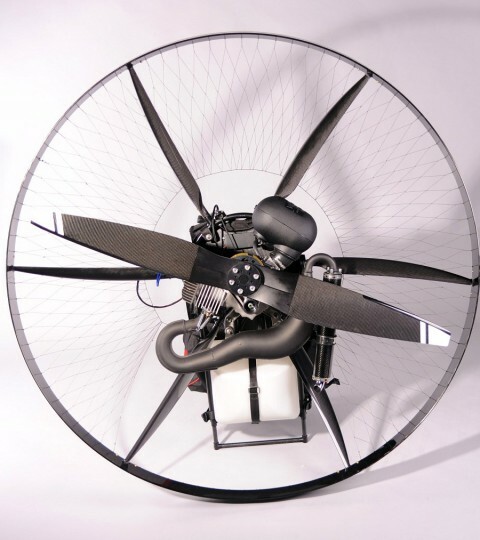 SCOUT is the only paramotor in the world to precisely compensate the torque effect throughout the whole power range. This ensures level flight without pilot input, perfect handling and precise turning capability around pylons. Read more on the Innovations page. 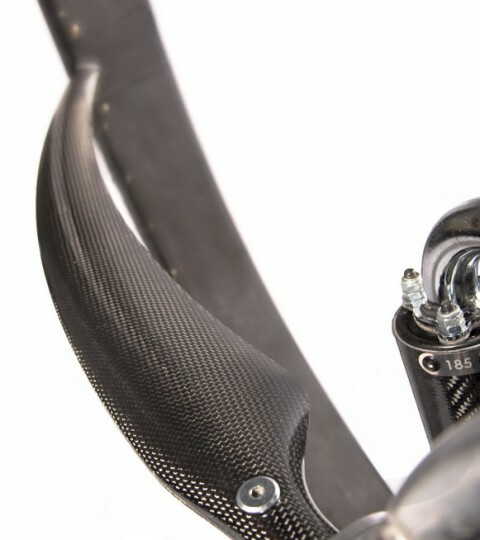 Carbon fibre is extremely strong while maintaining low weight, it is widely used in aviation, formula one or high-end bikes. 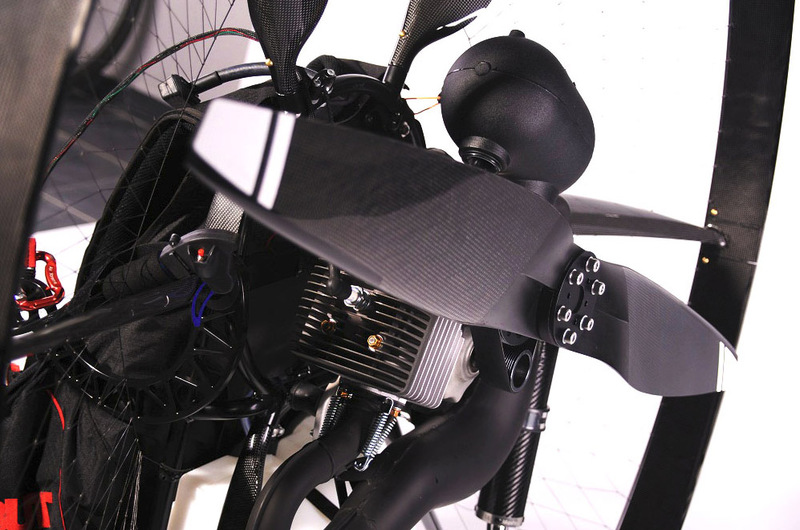 Now, not only the propeller but the whole cage is made of carbon composites.Read more on the Innovations page. The airfoil profile of the cage has four times lower drag than a tube of the same diameter. Fly faster and burn less fuel with lower rpm! 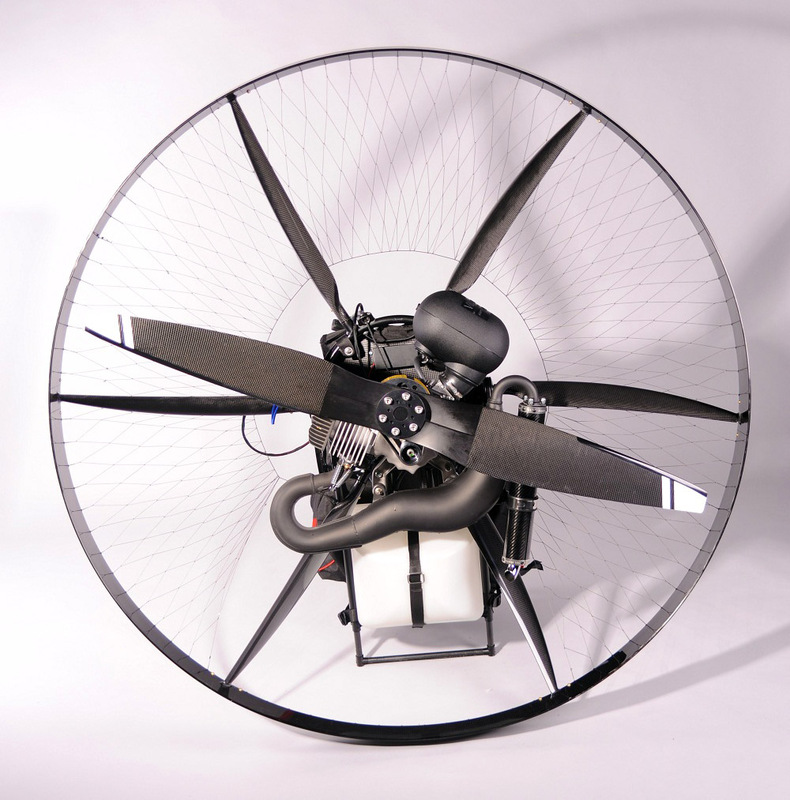 Set the angle lower when maximum power is needed such as flying very small wings, pylon racing or tandem flights. We also prefer to fly lower angle of attack in winter. Set the angle higher for best fuel economy. This really helps to reduce consumption by 25%! 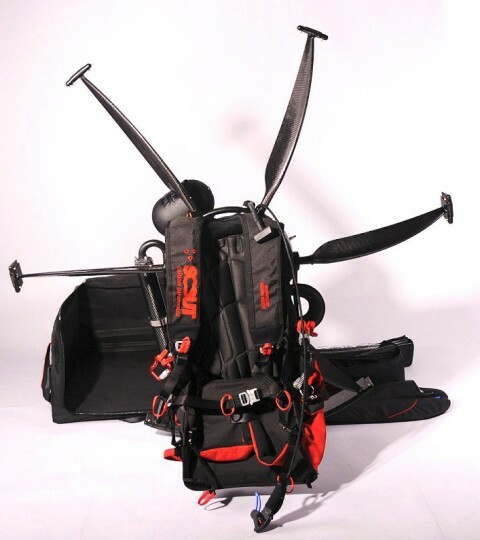 The overall shape of the swivel barsis designed by pilots, for high agility and best comfort. The swivel arms are mounted on the frame exactly in the thrust line. The hang-points are at the height of the thrust line which ensures neutral pitch position. When you press the throttle the power is transmitted to the hang-points without pitching the paramotor and the pilot. Use the efficient weight-shift system with high level of comfort. The structure is designed to maximize strength and reduce weight. Look at the asymmetric pattern of the ribs, their variable thickness and radius. This is pure engineering. This is not only a comfort but also a safety issue. The carbon shield spreads the weight / intensity over a large surface of your back in case of impact. Although we hope, of course, that you never have to see for yourself. Forget about back-pain or dirty knees Pull the stand to have it chest-high (!) when getting into the harness. It has never been so comfy. 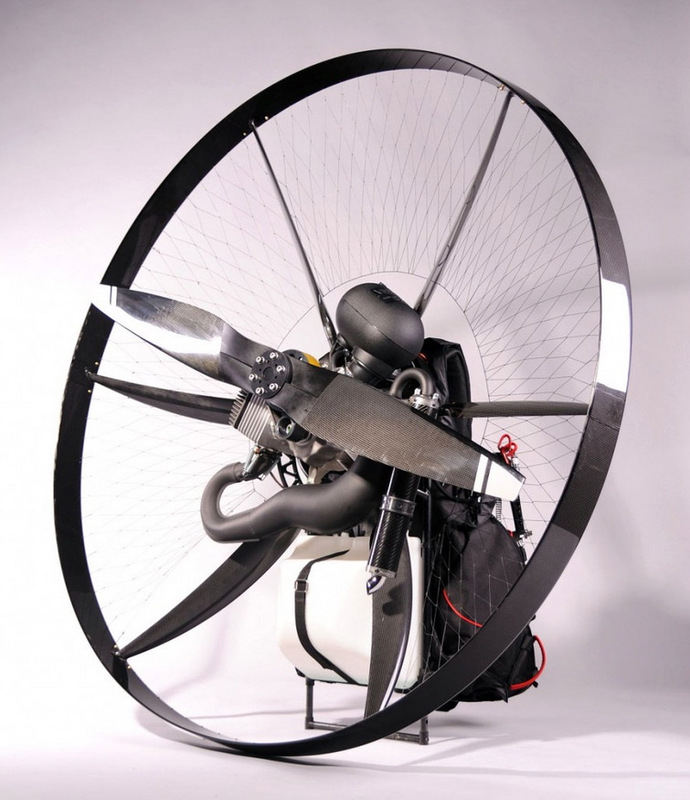 The SCOUT is easy, one of the easiest high-power paramotors. But the wheels help a lot more even on a grass airfield. When disassembled, all parts fit within the paramotor body length, this way the size when packed is just as big as the engine and the tank. Even the telescopic stand helps to reduce to size of a packed paramotor. 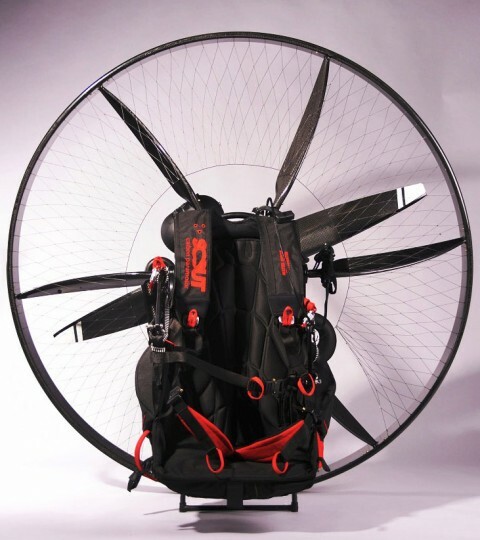 The packed paramotor is very flat – even fits into a convertible. The SCOUT comes with a very light bivouac bag (optional) that can be packed into the pocket on your harness. Put it on your back and travel anywhere. Find a nice place, unpack, and take off and have your bag with you. The weight is close to your body and pretty high up. This ensures maximum comfort. 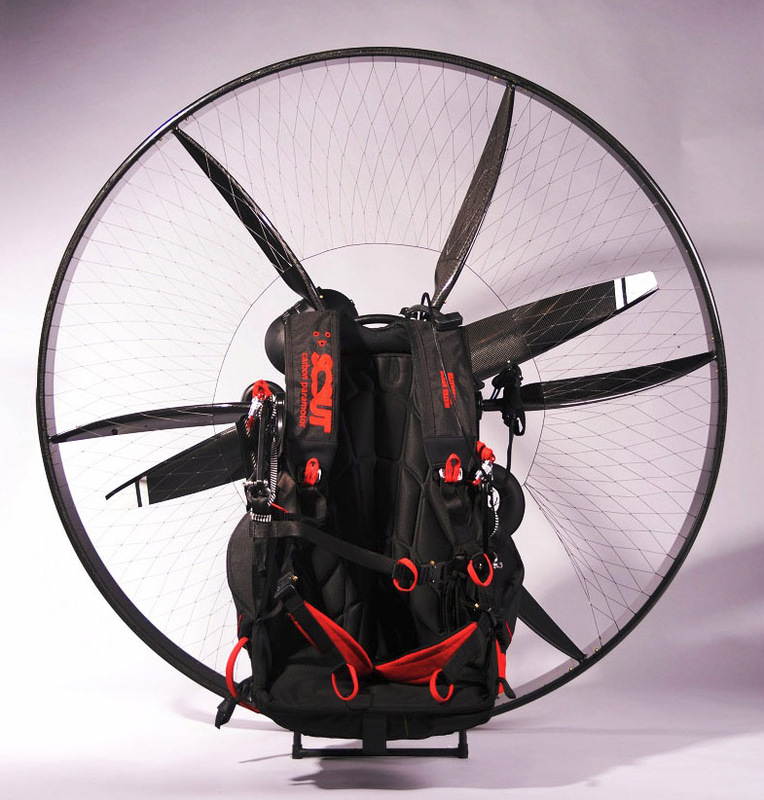 The paramotor feels even lighter without pulling your back. The Vittorazi Moster 185 engine is the best high-powered engine we have found. It has 25 HP with only 2 kg more weight than the TOP80! 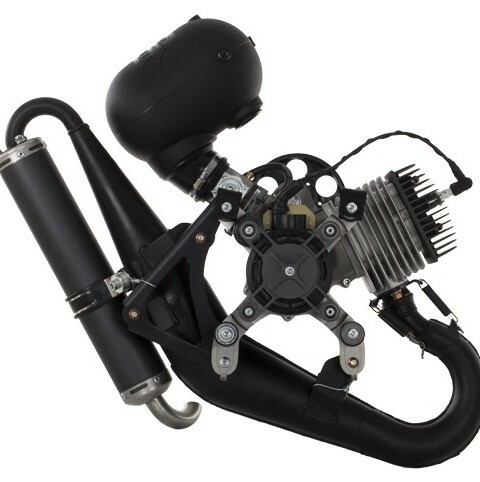 Unlike other high powered engines, the Moster runs low RPM which increases durability and reliability of the engine. Instantly read the engine RPM, cylinder head temperature and Tacho. 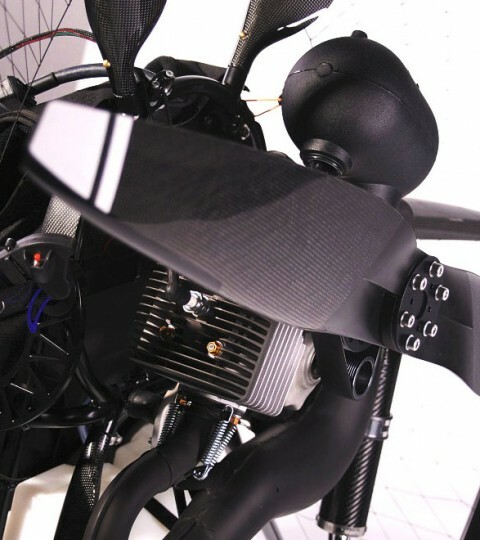 The propeller is nicely hidden in the carbon cage to prevent line cutting if the take-off or landing goes wrong. It may save your glider. Starting any paramotor is dangerous and accidents may happen. Propeller strikes usually happen when the engine peaks up to full power immediately upon start-up and the pilot, surprised by the power, fails to kill the engine quick enough. It may happen due to the carburetor getting stuck, broken throttle controller or pilot error. 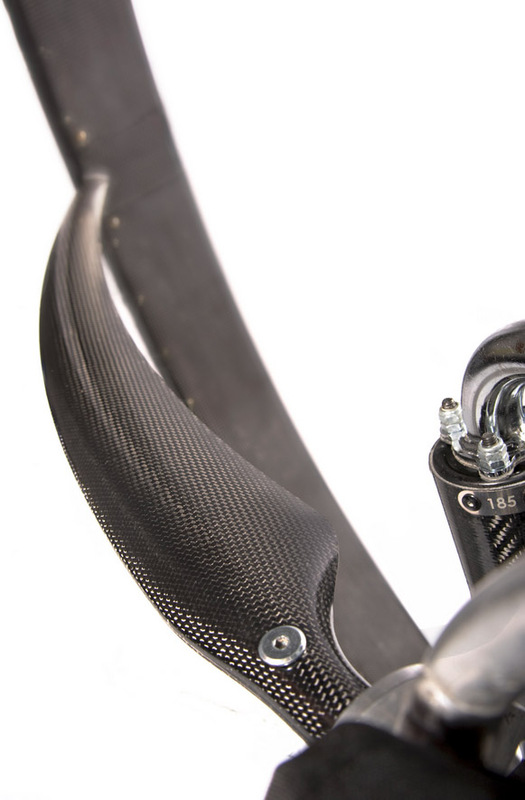 SafeStart is a simple small switch on the paramotor frame. Switch it to the ON position and just forget about it. It only needs replacing the batteries once a year. No other maintenance needed. To start the engine, pull the coil. The Moster is easy to start and everything runs just as you are used to. If for whatever reason the engine revs up within the first 4 seconds after start-up, SafeStart will kill the spark plug circuit instantly and the prop will stop. If everything runs smoothly, SafeStart goes to sleep mode after 4 seconds and you can use the engine without restrictions. We recommend our pilots have the SafeStart always on. If the batteries in the SafeStart run out, you are still able to fly. But please, be careful when starting the paramotor and replace the batteries as soon as possible. The dyneema fibre used for netting is only .35 mm thick, this is four times thinner than regular netting. This means four times lower drag. Fly faster, burn less fuel.